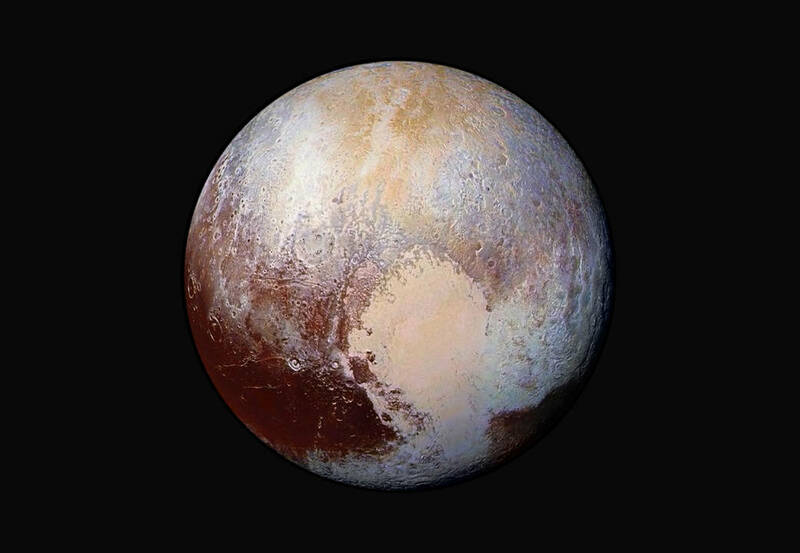 Without a smidgen of hesitation, I name Pluto news-maker of 2015. Not since childhood Moon landings, has space exploration garnered the attention of New Horizons mission to Pluto. New Horizons doesn’t mind collective ignorance of her stoic journey. Ten years across 3 billion kilometers was never meant to be a matter of public scrutiny. July 14, 2015, New Horizons blushed with pride. Unprepared for accolades and global admiration, New Horizons mid-summer fly-by of “once a planet” Pluto snagged imaginations of the world. Overnight, Pluto and its moons rode a wave of awe and wonder. Mars might be a proper planet, but insignificant Pluto is glorious. 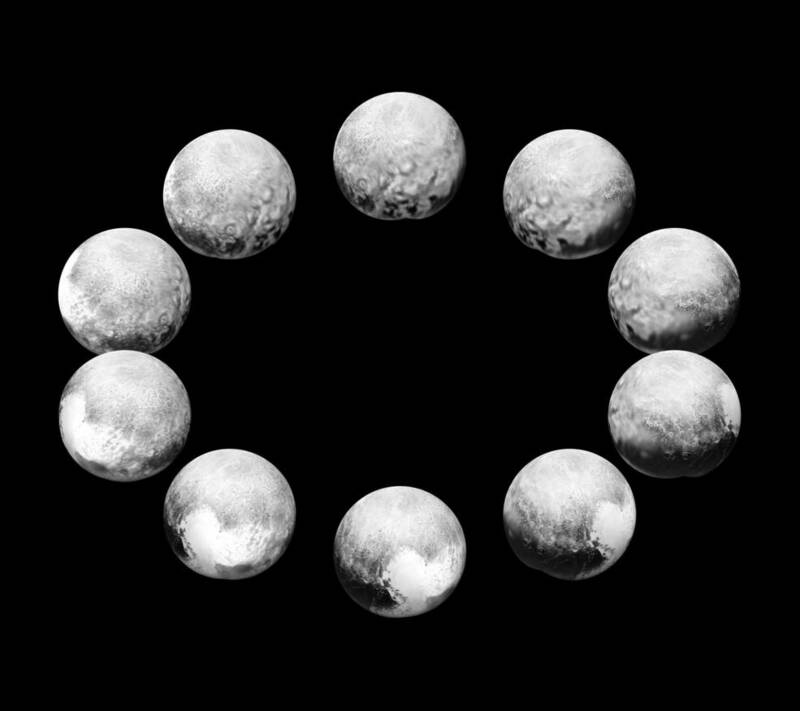 Pluto captured our hearts in 2015 – nothing will ever be the same. 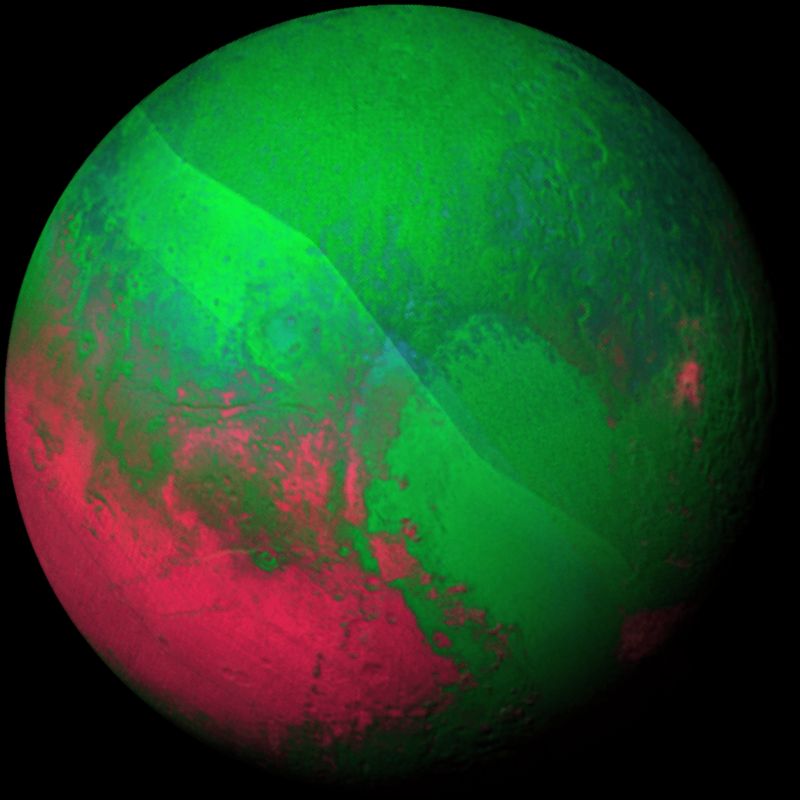 Pluto gets into the holiday spirit, decked out in red and green. This image was produced by the New Horizons composition team, using a pair of Ralph/LEISA instrument scans obtained at approximately 9:40 AM on July 14, from a mean range of 67,000 miles (108,000 kilometers). The resolution is about 7 kilometers per LEISA pixel. Three infrared wavelength ranges (2.28-2.23, 1.25-1.30 and 1.64-1.73 microns) were placed into the three color channels (red, green and blue, respectively) to create this false color Christmas portrait. 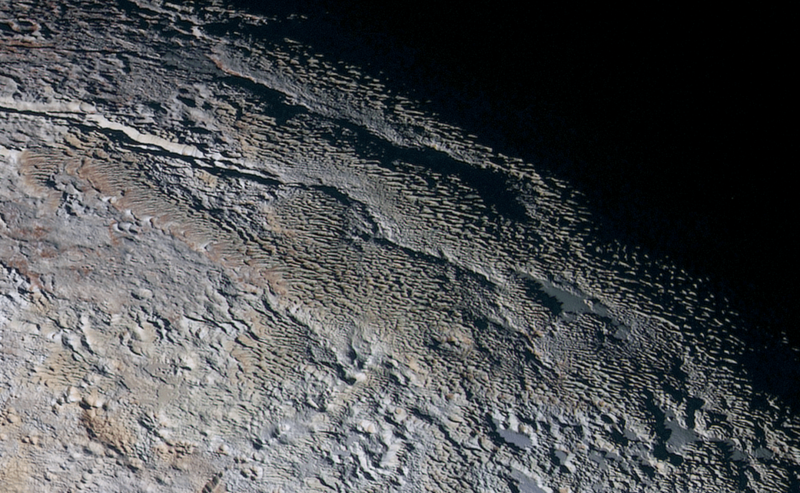 In this highest-resolution image from NASA’s New Horizons spacecraft, great blocks of Pluto’s water-ice crust appear jammed together in the informally named al-Idrisi mountains. Some mountain sides appear coated in dark material, while other sides are bright. Several sheer faces appear to show crustal layering, perhaps related to the layers seen in some of Pluto’s crater walls. Other materials appear crushed between the mountains, as if these great blocks of water ice, some standing as much as 1.5 miles high, were jostled back and forth. 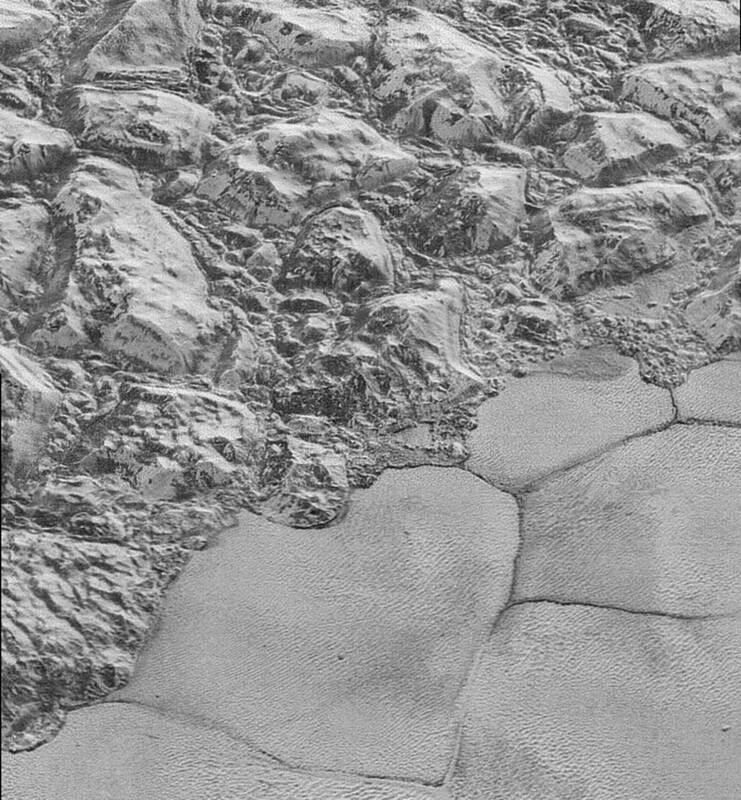 The mountains end abruptly at the shoreline of the informally named Sputnik Planum, where the soft, nitrogen-rich ices of the plain form a nearly level surface, broken only by the fine trace work of striking, cellular boundaries and the textured surface of the plain’s ices (which is possibly related to sunlight-driven ice sublimation). This view is about 50 miles wide. The top of the image is to Pluto’s northwest.